Sensitive, unsettled, irritated, dry and dehydrated skin needs particular care. 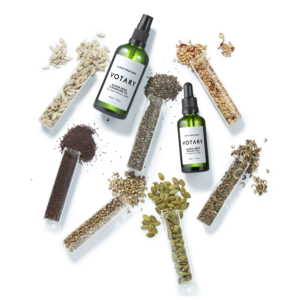 Votary Super Seed formulas are totally pure and natural, and have been designed to feed and care for stressed-out skin. Our most nourishing and gentle range, they restore comfort and glow, and sow the seeds for beautiful, calm skin. Begin with our most nourishing cleansing oil. 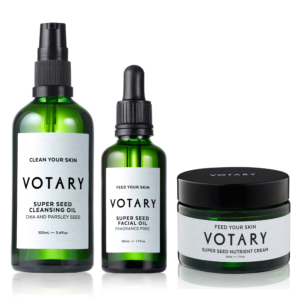 Super Seed Cleansing Oil works in harmony with your skin, whisking away make-up, grime and pollution to leave your face feeling properly clean and comfortable. It’s packed with all the goodness of chia, green tea, pumpkin, pomegranate, rosehip, borage, broccoli, raspberry and blueberry, and delicately fragranced with uplifting parsley seed oil. 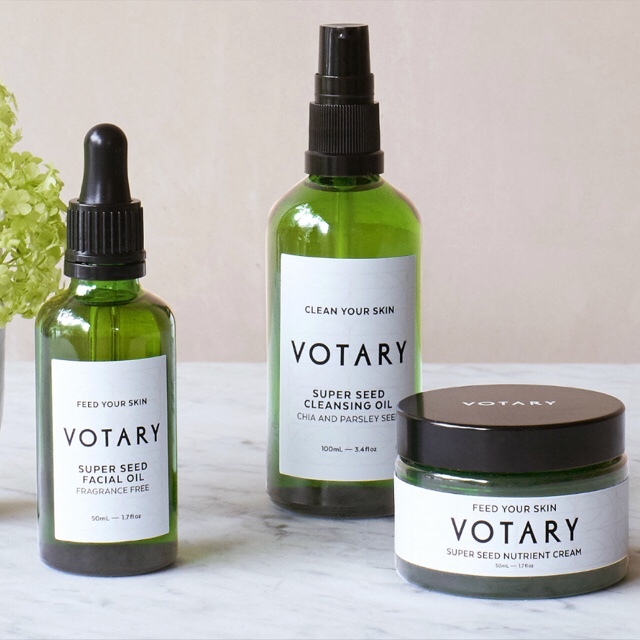 The Votary cleansing routine (read more here) means that your skin doesn’t feel taut and tight after cleansing. It feels clean, supple and soft because it’s simply the best way to clean your dry, sensitive skin. After cleansing, follow with Super Seed Facial Oil for calming, restoring hydration. Fragrance-free, it’s packed with botanical goodness to nourish and hydrate your skin. Simply add three or four drops to your palms and massage in gently. (For some lovely facial massage techniques read here). Your skin will feel smooth, plumped-up and restored. For those with skin that is suddenly uncharacteristically sensitive, Super Seed Facial Oil is also brilliant at tackling life stage issues. Everyone’s skin can go through changes like intermittent dryness, redness, or loss of elasticity or glow. Stress, pregnancy and menopasue can also alter skin type. Super Seed Facial Oil helps to calm and re-set your skin, and nurtures it back to glowing health. If your skin needs an extra layer of protection, if you’re experiencing prolonged redness or dehydration, or it’s very cold outside, add our Super Seed Nutrient Cream to your routine. 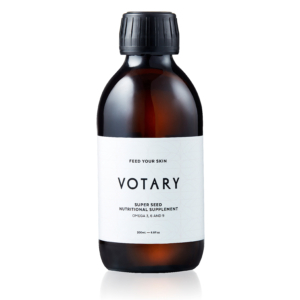 Layering Super Seed Nutrient Cream over your Votary facial oil will nourish, soothe and protect.A carefully formulated source of support for fragile skin, it’s fragrance-free, totally natural, and contains our classic, twenty two super seed oils. Super Seed Nutrient Cream helps to create a pure barrier between your face and the world. Deeply nourishing and protective, it leaves your skin matte, smooth and comfortable and ready to face the elements. The final player in our Super Seed range is the Super Seed Nutritional Supplement. I believe what you put in your body is just as important as the products you use on your skin. 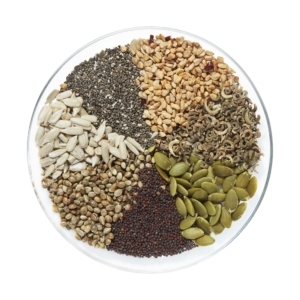 Our Super Seed Nutritional Supplement is a blend of 10 select virgin cold-pressed seed oils, including organic hemp, borage and chia. Rich in omegas 3, 6 and 9 essential fatty acids, it supports beautiful skin, glossy hair and strong nails. Eat by the delicious daily spoonful, or drizzle onto food for a shot of goodness. It also makes a wholesome contribution to salad dressings and smoothies. Read here and here for additional reviews.